Axes set at ZeroValue position will not always be drawn correctly. They may be clipped off outside of the chart area, and when zooming, the axis ticks will change size. To use a cartesian chart, the minimum you need to do is set a model using setModel(), set the model column that holds the X data using setXSeriesColumn(int modelColumn), and add one or more series using addSeries(WDataSeries*). Each series corresponds to one data column that holds Y data. In a CategoryChart, the X series represent different categories, which are listed consecutively in model row order. The X axis scale is set to CategoryScale. In a ScatterPlot, the X series data are interpreted as numbers on a numerical scale. 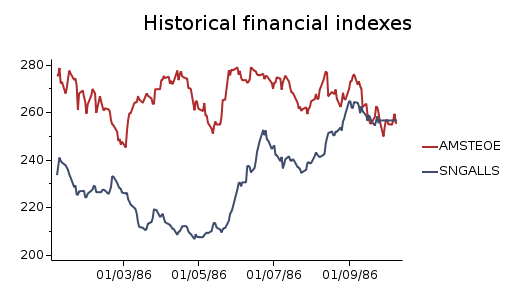 The scale for the X axis defaults to a LinearScale, but this may be changed to a DateScale when the X series contains dates (of type WDate) to create a time series chart, or to a LogScale. A ScatterPlot supports the same types of data series as a CategoryChart, but does not support stacking. In a scatter plot, the X series do not need to be ordered in increasing values, and may be set differently for each dataseries using WDataSeries::setXSeriesColumn(int modelColumn). By default a chart has a horizontal X axis and a vertical Y axis, which corresponds to a Vertical orientation. The orientation may be changed to Horizontal using setOrientation(). Creates a cartesian chart of type CategoryChart. Currently, an area is only created if the Wt::ToolTipRole data at the data point is not empty. The chart will take ownership of the given series. This removes the first data series which plots the given modelColumn. The series will be deleted. Ownership is transferred and a previously set (default) axis is deleted first. If the data series is of type LineSeries or CurveSeries, the crosshair can only be moved in the x direction. The y position of the crosshair will be determined by the value of the data series. The crosshair will snap to the nearest point that is defined in the data series. The legend can be renderd either inside or outside of the chart area. When location is Chart::LegendInside, the legend will be rendered inside the chart. When location is Chart::Legendoutside, the legend is rendered outside the chart, in the chart padding area. The default location is Chart::LegendOutside, Wt::Right and Wt::AlignMiddle. Sets the chart orientation, which corresponds to the orientation of the Y axis: a Wt::Vertical orientation corresponds to the conventional way of a horizontal X axis and vertical Y axis. A Wt::Horizontal orientation is the other way around. The default orientation is Wt::Vertical. The series with the given model column will be selected. The other series will be shown in a lighter color. The series that is currently selected is the one that can be manipulated if curve manipulation is enabled, and it is a LineSeries or CurveSeries. Replaces the current list of series with the new list. The chart takes ownership of all of the series. All series currently associated with the chart will be deleted. Hence, these series should be distinct from the currently associated series of this chart! If series selection is enabled, series can be selected with a mouse click or long press. If the selected series is a LineSeries or CurveSeries, it can be manipulated if curve manipulation is enabled. The series that are not selected, will be shown in a lighter color. The chart type determines how (x,y) data are interpreted. In a CategoryChart, the X values are categories, and these are plotted consecutively, evenly spaced, and in row order. In a ScatterPlot, the X values are interpreted numerically (as for Y values). The default chart type is a CategoryChart. Use this method to specify the default data for the X series. For a ScatterPlot this is mandatory if an X series is not specified for every WDataSeries. For a CategoryChart, if not specified, an increasing series of integer numbers will be used (1, 2, ...).